I have no idea what on earth “Exit Through the Gift Shop” is supposed to be, and I realize I’m not the first person to say that. It’s been puzzling viewers willing to wade through its quirky documentary style for months now, and I’m just now joining the fray. Is it real or is it some sort of prank/hoax? A part of me says who knows; another, who cares. It’s a darn entertaining movie even if I can’t get a read on what the heck it is. Perhaps it’s only so perplexing because the documentarian, Banksy, was so intimately involved in the storyline itself that we can’t be sure how partial or impartial he is being. Because Banksy, a god among the cult of street art, is underground, his face can never be seen nor can his true voice be heard without a muffler. Obviously his identity is a big unknown, but the bigger question is his role in the movie itself. It’s hard to distinguish between Banksy the director and Banksy the person/character, largely because he’s such an obscure and emotionless figure. The persona of the mysterious Banksy looms large over the story that ultimately isn’t about him. 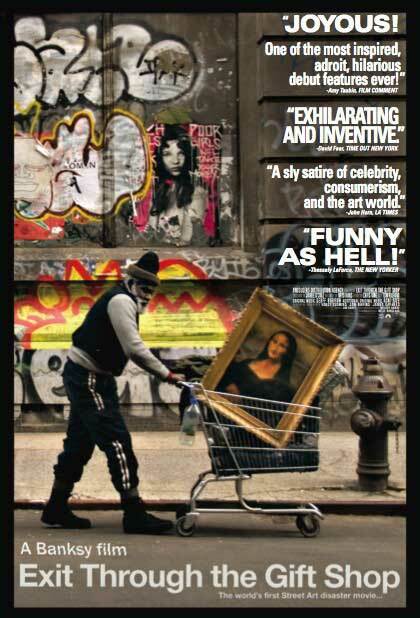 “Exit Through the Gift Shop” is, at least on the surface, about Thierry Guetta, now known as Mr. Brainwash. The movie chronicles his meteoric rise to street art superstardom, all the way from his obscure beginnings as a shopkeeper in Los Angeles. Thierry carried a camera with him everywhere, filming practically everything. He became fascinated with the underground world of street art in 1999, and from that moment on, he became dedicated to making a documentary about it. But this isn’t a documentary about a man making a documentary; Banksy isn’t a revolutionary figure in modern art because he choose simple subjects. Thierry’s journey is a very strange one, filled with as many twists and turns as a labyrinth. All of a sudden, he morphs from street art’s biggest fan into a street artist himself, opening a massively-hyped exhibition in Los Angeles without building a name through small projects at all. The transition is strange, and it’s clear that Banksy and some of the street artists hold him in contempt for hypocritically popularizing their craft. This only makes the lens that much more muddled, and you have to wonder where reality stops and where fiction takes over. I want to see this. I’m a big fan of Banksy’s work, it’s almost always poignant, witty, and artful. I almost feel the same way about this that I do about I’m Still Here. Whether or not it’s a hoax isn’t really the point. Hopefully I articulated well enough that the whole hoax/reality thing wasn’t a deal-breaker for me. It just adds a certain level of confusion – which isn’t always a bad thing. Loved this one. I think whether it’s real or fake is sort of besides the point, as regardless of its veracity it’s a compelling, well-made and entertaining movie all on its own merits. If nothing else it’s a window looking into street art culture, but I also think it’s a pretty harsh indictment of the the art world in how easily Guetta blows up in spite of his blatant fakery and lack of genuine artistic talent.